Draper's Tab Tensioning System keeps projection screen flat, providing the best possible picture. 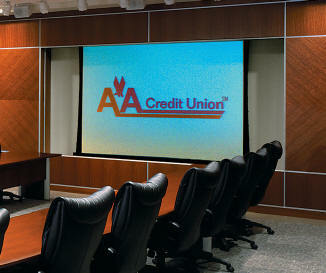 With control options, this projection electric screen can be operated from any remote location. Depending on surface, available in sizes through 12' x 12' and 15' NTSC. It’s easy to see why the Access Series is so popular. The Access is the most versatile ceiling-recessed, motor-in-roller screen on the market. No other projection screen offers you the benefits of installing the case during construction, and quick connecting the screen at a later date to eliminate job site damage. It's easy to switch screen surface or format making it less expensive than buying a new screen. Motor-in-roller is mounted on special vibration insulators so operating noise is dramatically reduced. The tab-tensioned screen consists of a reflective vinyl surface with no textile backing and is tensioned for sufficient flatness to perform properly. The surface is stretched flat, resulting in better picture quality. Hanging brackets slide in channels on top of the case, allowing unlimited adjustment to avoid interference with conflicting building structures. A pre-wired junction box inside (left end standard), and cable exit holes on top. “Pin connector” electrical connection of screen to junction box eliminates tools. Flange supports ceiling tile or trims the opening of any type of ceiling. Bottom of case forms a slot for fabric passage, and is removable without tools for installation or replacement of screen.